Walking with Jesus: Day 188: John 16:25-33 & Psalm 67 - Does Jesus Promise Us a Life of Trouble? Day 188: John 16:25-33 & Psalm 67 - Does Jesus Promise Us a Life of Trouble? Does Jesus Promise Us a Life of Trouble? Verbs are the words that tell you what's happpening (or has happened or will happen) or what may happen (or may have happened or might happen in the future). Verbs that indicate past, present or future reality are in the indicative mood; they indicate. But verbs that tell you what might or could or should happen are in the subjunctive. What difference does it make? In John 16:33, these mood differences make all the difference. Jesus says, "In this world you will have tribulation." That's indicative. That indicates reality. In this world, you definitely have tribulation. It not just what might be, what could be, what is possible or even likely. Tribulation is the reality of life in this world. Something else essential is indicative here, too: Jesus says, "I have overcome the world." That's also indicative. Jesus had definitely and truly overcome the world. It's interesting that Jesus speaks of this overcoming as a finished and accomplished reality (perfect tense) before He goes to the cross and is raised from the dead. He leaves not a sliver of doubt about His overcoming. It's a definite reality. So, where is the subjunctive? "In me you may have peace." Peace is to be found in Jesus alone, because He alone has overcome the world. But there's no guarantee that we're going to have it. We may have it. It's possible. The reason why Jesus speaks the things He says in this whole final teaching to His disciples in John 14-16 is so that they may have peace in Him. So how does may have peace move out of the subjunctive into the indicative? How does "may have" become "have"? By faith. The fact that peace is found in Jesus is not in question, because He has overcome the world. The question is whether or not we will trust in Him. In this world, we will have tribulation. 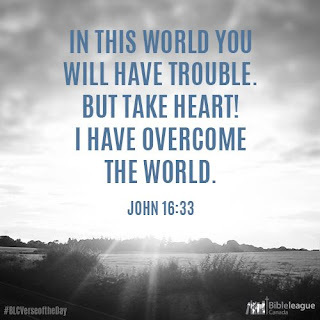 Jesus has overcome the world. Only in Him alone may we have peace, and that comes only by faith. let all the nations, tribes, peoples and tongues praise you! You, our God, shall bless us. that all the ends of the earth may know and fear You alone!